By Keith Cowing on February 28, 2018 11:11 PM. 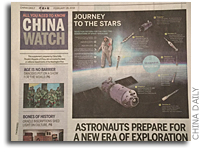 Keith's note: Every month or so I open my morning copy of the Washington Post to be greeted by a 8 page, full color insert - called "China Watch" ;-) - that China Daily pays to shove inside my paper - the same one that everyone in DC reads (larger image). 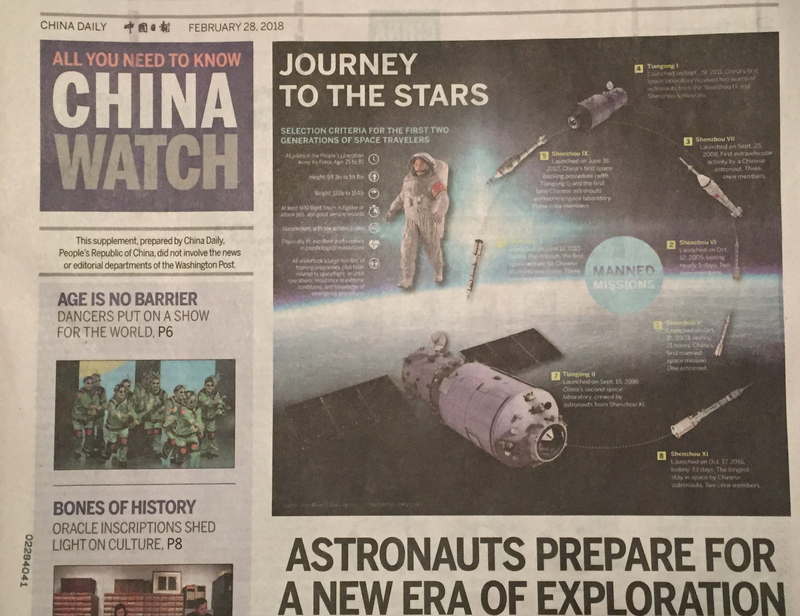 Today's insert had an above-the-fold headline story titled "Astronauts Prepare For a New Era of Exploration". This certainly sounds like a headline that this White House would issue, right? But its not. China's state media editors who write the text for these things do not mince words when it comes to what they see lying ahead: "If the United States-led International Space Station is retired as planned in 2024, the new, yet unnamed, Chinese facility will become the only permanent space station." By Keith Cowing on February 28, 2018 9:42 PM. 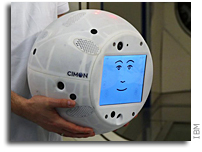 "CIMON is currently being developed by Airbus on behalf of the German Aerospace Center (DLR) as an intelligent, mobile and interactive astronaut assistance system. This new technology will be tested on the ISS as part of the Horizons mission of the European Space Agency. CIMON's digital face, voice and use of artificial intelligence make it a "colleague" to the crew members. This collegial "working relationship" facilitates how astronauts work through their prescribed checklists of experiments, now entering into a genuine dialogue with their interactive assistant. The developers responsible for CIMON predict that this will help reduce astronauts' stress and at the same time improve efficiency." Keith's note: Sounds like a cool project. Alas, the user interface could have probably used a larger budget and not a pixelated Gameboy face. Maybe some quality time from a human who has interacted with droids before would have helped. Since this droid can "learn" maybe it can learn to grow a face that isn't so creepy looking. I'm not certain I'd take a bot that looks like this seriously in an emergency or make friends with it. It sort of looks like a dazed Teletubby. Or maybe its a new head for Robonaut. 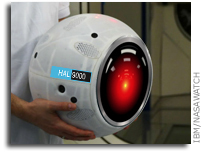 At least they did not use the HAL 9000 facial interface design. That said, don't say "open the pod bay doors" to this one, Dave. By Keith Cowing on February 28, 2018 2:13 PM. "Extending the launch window provided the project up to 4 months of schedule reserve. However, shortly after requesting the new launch window in September 2017, the project determined that several months of schedule reserve would be needed to address lessons learned from the initial folding and deployment of the observatory's sunshield. Given remaining integration and test work ahead--the phase in development where problems are most likely to be found and schedules tend to slip--coupled with only 1.5 months of schedule reserves remaining to the end of the launch window, additional launch delays are likely. The project's Standing Review Board will conduct an independent review of JWST's schedule status in early 2018 to determine if the June 2019 launch window can be met. JWST will also have limited cost reserves to address future challenges, such as further launch delays, and is at risk of breaching its $8 billion cost cap for formulation and development set by Congress in 2011. For several years, the prime contractor has overestimated workforce reductions, and technical challenges have prevented these planned reductions, necessitating the use of cost reserves. Program officials said that existing program resources will accommodate the new launch window--provided remaining integration and testing proceeds as planned without any long delays. However, JWST is still resolving technical challenges and work continues to take longer than planned to complete. As a result, the project is at risk of exceeding its $8 billion formulation and development cost cap." Keith's 1 March update: NASA PAO just sent me this statement to post: "After the successful test performance of the James Webb Space Telescope science payload last year, and the delivery of that payload to Northrop Grumman Aerospace Systems, NASA looks forward to the mission's final integration and test phase now that the two major observatory elements (science payload and spacecraft with sunshield) are together under one roof for the first time. As we enter this critical and challenging period, the Webb project is carefully reviewing its plans for the remaining tasks. The mission's Standing Review Board will begin an independent assessment of the project plans in mid-March with an expected report out in early April." By Keith Cowing on February 28, 2018 1:48 PM. Keith's note: NASA is holding a Deep Space Gateway meeting in Denver right now. A hundred or so people are there. It is invitation-only. No webcast. No Webex. So U.S taxpayers and media cannot see what is going on but foreign nationals were invited - so they can. NASA and LPI never said media could attend, never provided any way to register, and never released any other information to that effect. They ignored an email I sent several months back inquiring. Now, half way through the event I find out they have hand-picked news media in attendance. They claim that they cannot webcast this event since there are multiple sessions - yet it is so easy to do this with a cellphone and Facebook if need be. They also claim that since this is not a "decisional" meeting they do not see the need to webcast it yet they webcast things like this all the time. Public and media concerns aside, no one at NASA who is working on the Deep Space Gateway or people working at companies and universities supporting this research can watch it either. All we get are short abstracts and a summary that someone at NASA PAO without a technical background will write in a few months about what they think is important from what other people said. Scott Parazynski and I did live webcasts - daily - from 17,600 feet at Everest Base Camp 9 years ago using a small BGAN unit I carried on my back. NASA sent back live video of a Soyuz landing in Kazakhstan this morning and posting pictures shortly thereafter on Flickr yet they cannot webcast a simple meeting from a hotel in Denver about a project that will last several decades? This workshop is by invitation only and is not being live streamed. By Keith Cowing on February 27, 2018 6:34 PM. "While we have been strong proponents of the U.S. commercial space sector, prematurely ending direct U.S. Government funding of ISS could have disastrous consequences. The future of ISS should be determined by the emergence of a viable and proven commercial alternative and the needs of our national space program." The Senators continued, "In fact, Congress specifically required that the transition plan include cost estimates for extending operations of the ISS to 2024, 2028, and 2030, and an evaluation of the feasible and preferred service life of the ISS through at least 2028 as a unique scientific, commercial, and space exploration related facility. P.L. 115-10 specifically required the NASA Administrator to deliver a report to Congress no later than December 1, 2017. As of today, that report has not been delivered to Congress as required by federal statute." By Keith Cowing on February 26, 2018 4:10 PM. Sources report that George Nield is retiring from @FAA. Is Privatizing ISS A Smart Thing To Do? By Keith Cowing on February 23, 2018 6:32 PM. "What about privatizing the ISS? That idea is barely worth mentioning. The ISS was designed to operate with two big mission control centers, in Houston and Moscow. They each need standing armies of onsite engineers and technicians around the clock to monitor and send commands to the station. Estimates of the cost of launching spacecraft to the ISS vary, but they are certainly in the range of $100 million or more. Let's not even consider maintenance costs. Tell me with a straight face how a commercial entity is going to make money operating ISS? The Trump administration's thoughts to cancel ISS and send the savings to the moon is déjà vu. The actual savings will likely be again around 50% of the ISS program cost, and all we are likely to end up with is an inadequately funded moon program, as we have had for the last nine years. And no ISS, either. This path would likely leave us with nothing but a bare-bones spacecraft and rocket and no funding to go anywhere. Unless, of course, we decide to fly American astronauts on Chinese spacecraft to the coming Chinese space station. This would be a national travesty. What we need is a real commitment to maintain US leadership in human spaceflight." By Keith Cowing on February 23, 2018 6:06 PM. Keith's note: Sources report that Andy Gamble has been allowed to retire and George Mitchell has been reassigned from NASA MSFC QD34 to Engineering. The SLS software team at MSFC is having great difficulty in hiring people to replace those who have quit. There is a lot of internal concern as a result of issues already raised with regard to SLS software safety to date that MSFC will literally have to go back to square one on software so as to verify it for use on human missions. By Keith Cowing on February 21, 2018 10:05 PM. "We've seen the increasing number of American businesses sending experiments to the International Space Station. We've witnessed the power of commercial satellites to reconnect isolated communities in the wake of natural disasters. And of course, just a couple of weeks ago, the world watched with wonder as the Falcon Heavy blasted off from this very shoreline, and then moments later sent two of its boosters sailing back down to Earth, where they landed side-by-side, intact, less than a mile from where they'd lifted off. Very impressive indeed. The evidence is clear: While the government can blaze new trails into exploring the outer expanse of space, like all frontiers, ultimately that will be settled by the dreams of our people, by the brilliance of our innovators, the energy of entrepreneurs, and the daring of our explorers together. This truth echoes through the history of the Kennedy Space Center, named for a President who challenged the American people to marshal the best of our, in his words, "energies and skills" to "become the world's leading space-faring nation." By Keith Cowing on February 21, 2018 5:14 PM. "Vice President Mike Pence, Chairman of the National Space Council, today announced the candidates selected to serve on the National Space Council's Users Advisory Group. Pending official appointment by the Administrator of the National Aeronautics and Space Administration, the selected members of the Users Advisory Group will serve to fulfill President Trump's mandate to "foster close coordination, cooperation, and technology and information exchange" across our nation's space enterprise. The announcement as made on the eve of the second meeting of the National Space Council. "Moon, Mars, and World Beyond: Winning the next Frontier" includes testimonials from leaders in the civil, commercial, and national security sectors about the importance of the United States' space enterprise." Keith's note: I find this comment posted by Mark Uhran to be most apt: "These are almost exclusively "sellers" of space services. This is supposed to be a "Users Advisory Group"-- users are potential "buyers". This is a fundamental distinction. The failure to recognize the difference between the supply side and demand side is troubling, and persistent in the civil space culture. There is far more space infrastructure available than ever previously in history, yet few non-government buyers (COMSATS are the notable exception). The "build it and they will come" approach has not succeeded. Good luck to Dave Wolf and Pete Worden in trying to bring any user (buyer) perspective to this group." Of the 29 names, 12 (listed below) are from big aerospace, new/old space, and/or its trade organizations. Only a few of the people listed are currently in the business of developing payloads. Back when I worked at NASA on the space station - with Mark Uhran - we called those people who were going to utilize the space station "users". This Users Advisory Group is sadly lacking users. By Keith Cowing on February 21, 2018 1:53 PM. The #NSPC meeting started late so it is ending 20 minutes early. All this hoopla, receptions, stop work in multiple buildings at KSC for photo ops and talking points. Now they are playing a Souza march as @VP runs to his plane. And #NASA TV just shut off. Wow, what a day. Between yesterday's Bigelow announcement and today's #NSPC presentations China is simultaneously the greatest threat/competitor/potential partner for the U.S. in space. Now @VP Pence is reminding everyone how, under President Trump "America is leading in space once again". But wait - what has @NASA done in the past year? Answer: what it was going to do anyway. By Keith Cowing on February 21, 2018 1:41 PM. "RECOMMENDATION 1: The Secretary of Transportation should work to transform the launch and re-entry licensing regime. RECOMMENDATION 2: The Secretary of Commerce should consolidate its space commerce responsibilities, other than launch and reentry, in the Office of the Secretary of Commerce. RECOMMENDATION 3: The National Telecommunication and Information Administration should coordinate with the Federal Communications Commission to ensure the protection and stewardship of radio frequency spectrum necessary for commercial space activities. RECOMMENDATION 4: The Executive Secretary of the National Space Council, in coordination with members of the National Space Council, should initiate a policy review of the current export licensing regulations affecting commercial space activity." By Keith Cowing on February 21, 2018 12:38 AM. By Keith Cowing on February 20, 2018 7:49 PM. "Of Lockheed Martin's $51 billion in sales last year, nearly 70 percent, or $35.2 billion, came from sales to the U.S. government. It's a colossal figure, hard to comprehend. So think of it this way: Lockheed's government sales are nearly what the Trump administration proposed for the State Department next year in its recently released spending plan. Or $15 billion more than all of NASA. Or about the gross domestic product of Bolivia. With a White House proposal to spend a massive amount on defense next year in what one consultant called an "eye-watering" budget for the defense industry, Lockheed, the world's largest defense contractor, could get even more. ... Boeing is in second place with annual sales of $26.5 billion in 2016, a year in which the top five defense contractors -- including General Dynamics, Raytheon and Northrop Grumman -- had total sales of nearly $110 billion to the U.S. government, according to federal procurement data. The five biggest defense contractors took in more money from the U.S. government than the next 30 companies combined." Bigelow and CASIS Are Working Together on ISS. NASA Really Doesn't Care. By Keith Cowing on February 20, 2018 5:30 PM. Keith's note: I submitted a series of questions to NASA PAO and NASA HEOMD this morning (the same questions I sent to Bigelow after the press event) in advance of this story's posting at 5:00 pm ET. Bigelow responded. NASA decided not to say anything other than what one of their PAO officers sent me by email at 5:12 pm "most of the questions seem better suited to Bigelow and/or CASIS, and I would recommend following up with them. Below is our statement. If I hear anything additional, I'll be sure to pass it along: "NASA supports entrepreneurial efforts as the marketplace in low-Earth orbit matures and we work to expand private interest in the lunar vicinity. NASA is proud of the role it plays in enabling companies to explore space." In other words "we're not really involved in any of this - so go ask someone else." Continue reading Bigelow and CASIS Are Working Together on ISS. NASA Really Doesn't Care..
By Keith Cowing on February 20, 2018 3:10 PM. Keith's note: Michael O'Brien, who ran international and interagency affairs for NASA for decades has died. A viewing will be held on Friday 23 February 6-8pm - Demaine Funeral Home in Springfield, Virginia on Backlick Road. The Funeral Mass will be held on Saturday 24 February 12:30pm - St. Bernadette, Springfield, Virginia on Old Keene Mill Road. Its Moon, Mars, and Beyond Time Again! By Keith Cowing on February 19, 2018 2:56 PM. "The President's Commission on Implementation of United States Space Exploration Policy is charged with making recommendations to the President on implementation of his vision outlined in the policy statement "A Renewed Spirit of Discovery" and in the President's Budget Submission for Fiscal Year 2005. The commission will also advise NASA on the long-term implementation of the President's vision." "Vice President Pence will lead the second meeting of the National Space Council at NASA's Kennedy Space Center. "Moon, Mars, and Worlds Beyond: Winning the Next Frontier" will include testimonials from leaders in the civil, commercial, and national security sectors about the importance of the United States' space enterprise. The Vice President will conclude his visit with a tour of Kennedy Space Center." By Keith Cowing on February 19, 2018 12:00 PM. Keith's note: Sources report that the membership of the National Space Council's User's Advisory Group (UAG) may be announced on Tuesday - or possibly Wednesday at the NSPC meeting. The UAG is larger than a lot of people wanted - partially as the result of many factions wanting to have their person representing their interests. I have been able to confirm a subset of the UAG membership thus far from multiple sources: Homer Hickam, Jeff Manber, Pam Melroy, Gwynne Shotwell, and Pete Worden. Note: 2 sources confirm Manber, another says he's not a member. I will add more names as I confirm them and correct any errors as they arise. Guess What: There is a National Space Council Thing This Week. By Keith Cowing on February 19, 2018 11:40 AM. "All media applications for credentialing must be received by 8 p.m. today, Feb. 19. ... NASA Television and the agency's website will provide live coverage of the meeting beginning at 10 a.m. EST." Keith's note: Gee, a whole 8 Hours advance notice for media to make travel plans after total silence with regard to media access. Obviously the NSpC wanted to limit media attendance as much as possible. Announcing media accreditation on a Federal holiday is one of the best ways to do that. At least we can watch people talking on TV. The way this is being rolled out is 100% White House. NASA has to do exactly what the White House tells them to do - or not do - even if it means sitting on things - and then foot the bill afterward. By Keith Cowing on February 18, 2018 4:19 PM. Keith's note: NASA and other agencies have issued zero media advisories. Multiple people have been confirmed as being members of the NSpC's Users' Advisory Group - yet none have been named publicly. A large reception sponsored and paid for by the major aerospace organizations and all of the major aerospace companies is planned during the meeting - yet no official public mention has been made of this event (you are not invited, BTW). Meanwhile, no mention is made on any NASA website or by other sponsoring agencies including the White House about NSpC activities in Florida. No word yet as to whether the NSpC meeting itself will even be televised for taxpayers to observe or if news media will be allowed to attend. Monday is a Federal holiday so don't expect a lot of updates. Don't know, sorry. They said it's here only through Tuesday. - Parking Lot 4 Opens 5:30 p.m.
By Keith Cowing on February 18, 2018 3:49 PM. "A lease application filed with the City of Alameda gives some clues about what's in the works: a rocket called Astra that the company claims is the world's smallest. The document includes a scale diagram showing its diminutive size and capacity compared to other rockets: The SpaceX Falcon Heavy, with a payload capacity of about 56,000 kg dwarfs the Astra rocket, which is made to carry only 100 kg -- a rocket aimed at launching the new generation of small satellites, the document says. ... We caught up with it and learned it belongs to a startup that doesn't have a name yet -- in fact, an employee cheerfully answered the phone by saying, "Stealth space!" when we called." By Keith Cowing on February 18, 2018 3:26 PM. Keith's 15 Feb note: The National Space Council (NSpC) (established by Presidential Executive Order) is having a big, potentially lavish, meeting at NASA KSC on 21 February in 5 days complete with a SpaceX Falcon Heavy booster on display. The NSpC's Users' Advisory Group (UAG) will also be meeting. The UAG is a FACA (Federal Advisory Committee Act) committee - yet no public announcement has been made in advance of this public meeting in the Federal Register per Federal law pertaining to publicizing standard FACA activities two weeks in advance. Nor has any formal mention been made of the NSpC meeting itself. No location has been announced and no attendance procedures for media or citizens have been announced. NASA and other agencies have issued zero media advisories. Multiple people have been confirmed as being members of the NSpC's Users' Advisory Group - yet none have been named publicly. A large reception sponsored and paid for by the major aerospace organizations and all of the major aerospace companies is planned during the meeting - yet no public mention has been made of this event (you are not invited, BTW). No mention is made on NASA's calendar page. No word yet as to whether this highly-staged event will be televised for taxpayers to observe. This is your National Space Council operating in stealth mode. 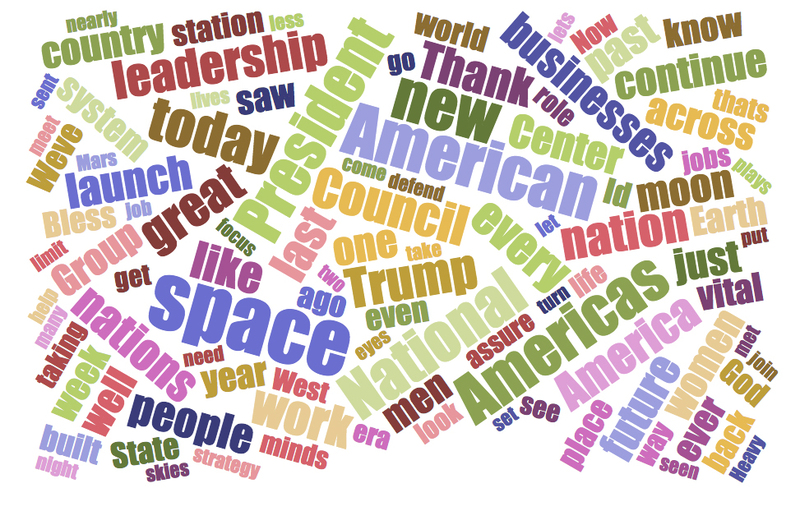 Continue reading The National Space Council Is Operating in Stealth Mode (Update). By Keith Cowing on February 16, 2018 10:24 PM. "NASA's Mars Exploration Rover Opportunity recorded the dawn of the rover's 4,999th Martian day, or sol, with its Panoramic Camera (Pancam) on Feb. 15, 2018, yielding this processed, approximately true-color scene." "The Sun will rise on NASA's solar-powered Mars rover Opportunity for the 5,000th time on Saturday, sending rays of energy to a golf-cart-size robotic field geologist that continues to provide revelations about the Red Planet." "One possible explanation of these stripes is that they are relics from a time of greater obliquity when snow packs on the rim seasonally melted enough to moisten the soil, and then freeze-thaw cycles organized the small rocks into stripes," Arvidson said." "This is a stunning achievement for a capability we thought would survive long enough for a sprint and instead, it's completed a marathon and still going! Opportunity was designed, built, flown and landed with materials and processes we had available. The limited planetary alignment opportunity forced the project team to make due with what they had. The performance since 2004 had surpassed anything anyone thought imaginable. If back in 2004 NASA had dared to declare what Opportunity has achieved as the mission objective, the legion of critics would have told us the cost, schedule and mission were unrealistic. Maybe that would be worth a hearing!" Alas, the Trump Administration is not interested in supporting Opportunity after FY 2019. This is not the first time that the White House has tried to kill funding for Opportunity (the Obama folks tried too). Congress will likely step in and halt this as they have in the past. That said, maybe its time for someone to start a crowd funding effort. This White House wants NASA to do the public private partnership things, so why not take them up on that offer? By Keith Cowing on February 16, 2018 6:27 PM. "The Center for the Advancement of Science in Space (CASIS) today announced that President and Executive Director Gregory H. Johnson plans to leave the nonprofit organization effective March 10, 2018, after serving in that position for nearly five years. Johnson was named to the position in August 2013 with a mission to lead a diverse team of professionals in the unprecedented challenge to establish a national laboratory in space, the International Space Station (ISS) U.S. National Laboratory, and to foster the growth of a community of users and facilities on the lab for Earth benefit." By Keith Cowing on February 15, 2018 12:54 PM. Keith's 14 Feb note: Note that the all of the entries for this Solar Electric Propulsion project are blank (as is the case for RESTORE-L listed just before it in the document) and that there is a place holder image of a mountain with "Caption for Picture (No more than 10 lines)". OMB and NASA do not know what this thing does, are not certain what it looks like (SEP looks like a mountain? ), but they know exactly how much money they want to spend on it ($96 million). But they are also certain that NASA does not need to spend $99 million on an Education Office. Keith's 15 Feb update: Well NASA quietly updated the PDF file and removed the empty/blank template stuff for RESTORE-L and SEP but they never bothered to fix the document's table of contents. Now the page numbering does not match. What else is screwed up? Amateur hour. 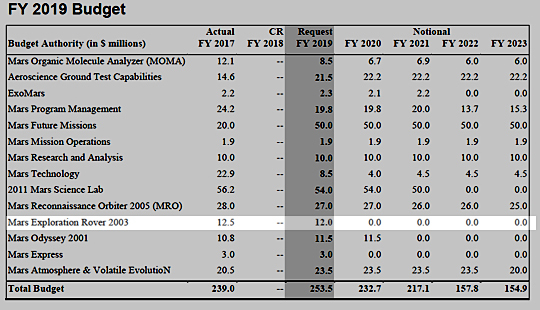 Continue reading NASA Releases Detailed FY 2019 Budget Information Minus Some Details. By Keith Cowing on February 14, 2018 7:15 PM. Keith's note: In the NASA FY 2019 Budget Estimates document released by NASA today, there is a claim that both the NASA Advisory Council (NAC) or Aerospace Advisory Panel (ASAP) have "No new formal recommendations or findings for the ISS". This is incorrect as listed below. It is also important to note that this budget document makes no mention of the 2018 NASA OIG report "NASA's Management of the Center for the Advancement of Science in Space (CASIS)" which notes that CASIS has been unable to fully utilize the ISS resources given to it by NASA and casts doubts on CASIS' ability to allow NASA to utilize the full future potential of the ISS; the OIG report "NASA's Plans for Human Exploration Beyond Low Earth Orbit" which questions NASA's ability to maintain the ISS, and the GAO Report "NASA Commercial Crew Program: Continued Delays Pose Risks for Uninterrupted Access to the International Space Station" which questions NASA's ability to access the ISS. Nor did the document mention that NASA has refused to deliver an ISS Transition report to Congress no later than 1 Dec 2017 as specified by Public Law No: 115-10. The clear intention of this budget document is to gloss over the facts and give the impression that there is no disagreement with regard to NASA policy regarding the ISS - and its future. Continue reading NASA Budget Document Overlooks Multiple Advisory Group Findings and Recommendations on the ISS. ISS After 2025: Is CASIS The Solution Or The Problem? By Keith Cowing on February 13, 2018 5:27 PM. Keith's note: Yesterday NASA held a briefing with Acting CFO Andrew Hunter. When asked about how NASA plans to operate the ISS after 2025 when funding by NASA will cease, Hunter had no answer. The only clue he offered was that CASIS would continue to be part of the NASA space station utilization plan until 2025. Somehow, between now and 2025, NASA claims that it will be handing over all of its operational responsibilities to some yet to be defined private sector entities. It would seem, therefore, by default, that NASA intends to use CASIS to develop the multi-billion dollar customer base that will take over U.S. operations on the ISS and that NASA would be just another customer. How anyone can expect CASIS to complete a task several orders of magnitude greater than the one that they have failed to accomplish thus far is baffling in the extreme. All you have to do is read recent GAO and NASA OIG reports to see that there is extreme doubt with regard to CASIS' abilities. Of course, NASA has still refused to deliver the ISS Transition Plan mandated by law and due last year. Based on this budget briefing NASA clearly has no plan and they have only begun to work on it. #NASA CFO Hunter says @ISS_CASIS will be used through 2025. #NASA CFO Hunter is spouting incorrect information about ISS utilization - @ISS_CASIS has *not* been able to utilize all of the crew time that has been given to them - and CASIS admits that. "... With respect to crew utilization, between September 2013 and April 2017 CASIS was allocated 2,915 crew research hours on the National Lab, but CASIS-managed projects used only 1,537 (52.7 percent) of these hours. Although CASIS officials attributed the organization's limited success in this area to three failed ISS resupply missions in FY 2015, given its performance to date, CASIS utilization rates for the National Lab will likely further diminish when NASA adds an additional crew member to the Station in late 2018." "... In its FY 2016 assessment memorandum, NASA noted that absent growth in the project pipeline, the crew utilization rate for three crewmembers could drop below 50 percent. NASA intends to increase the number of crew aboard the U.S. segment of the ISS from three to four in late 2018 and plans to allocate a portion of the additional crew hours available to CASIS who, in turn, will need to recruit additional users. Consequently, without sustained increases in the number of new and repeat users, CASIS's crew time utilization could fall even further when the fourth crew member is added." "... Even though in recent years NASA has become more involved in measuring CASIS's performance, the Agency still has not developed a performance strategy for the remaining 7 years of the agreement or provided quantifiable metrics by which to assess CASIS and help improve the organization's performance." "... Despite CASIS's recent progress, FY 2017 fundraising is still far below the amounts discussed in the original CASIS proposal. CASIS officials stated that they replaced the fundraising model in the reference model and original proposal with a sponsored program model, which focuses on obtaining external funding to directly support research and STEM projects. Officials explained that CASIS was not able to pursue all fundraising sources described in the reference model and proposal such as royalty fees, which were prohibited in the agreement, and the membership structure that was found to be unsuccessful." "... CASIS met only one of nine metrics related to outreach publicizing the unique benefits of using the National Lab to potential users, the White House, Congress, non-NASA Government agencies, commercial companies and researchers, media, kindergarten through grade 12 educators and students, and the general public." "... By 2024, NASA will have invested $196 million in CASIS. In our opinion, weaknesses in performance measurement and the lack of an overall strategy have created an environment in which NASA continues to accept incremental improvement rather than more tangible attainment of agreed-upon goals. Consequently, without significant change, CASIS likely will fall short of advancing NASA's goal for a commercial economy in low Earth orbit. NASA needs to engage more substantively with CASIS and exercise more effective oversight of the cooperative agreement to clarify CASIS's role in helping build a robust economy in low Earth orbit." By Keith Cowing on February 12, 2018 5:55 PM. By Keith Cowing on February 12, 2018 5:06 PM. "This addendum includes additional funding for a limited set of Administration priorities, but notably, it also proposes to use higher spending caps as an opportunity to fix some long-time budget gimmicks that the Congress has used to circumvent the spending caps and add billions to the Nation's deficits. ... National Aeronautics and Space Administration: $300 million to fund innovative exploration-related programs and address needs in other parts of the agency." Keith's note: So ... one would assume that had an overal budget deal not been reached last week (i.e. the Bipartisan Budget Act of 2018, mentioned in the opening of this letter) that NASA's budget would have only increased by $100 million. Note that the letter says the $300 million is to be used to "fund innovative exploration-related programs and address needs in other parts of the agency". Not very specific. Keith's update: Acting NASA CFO just admitted that this budget plus up was a "surprise" and that they have to adjust their detailed budget document to show where they will spend the money. This is a nice position to be in - but NASA's budget is expected to be more or less flat in the out years which actually means a slow motion budget cut due to the eroding effect of inflation. By Keith Cowing on February 12, 2018 12:07 PM. "Lightfoot will provide a "State of NASA" address to the agency's workforce at 1 p.m. EST from Marshall Space Flight Center in Huntsville, Alabama. His remarks will air live on NASA Television and the agency's website." "It is my privilege today to present President Trump's Fiscal Year 2019 budget request of $19.9 billion for NASA. It reflects the Administration's confidence that through NASA leadership, America will lead the way back to the Moon and take the next giant leap from where we made that first small step nearly 50 years ago. This budget focuses NASA on its core exploration mission and reinforces the many ways that we return value to the U.S. through knowledge and discoveries, strengthening our economy and security, deepening partnerships with other nations, providing solutions to tough problems, and inspiring the next generation. It places NASA and the U.S. once again at the forefront of leading a global effort to advance humanity's future in space, and draws on our nation's great industrial base and capacity for innovation and exploration." "The Budget proposes the termination of the Office of Education and its portfolio of programs and projects. Unobligated balances previously appropriated under this heading may be used to support close-out costs. Moving forward, a small team at NASA headquarters funded out of Agency Management and Operations will be accountable for strategic direction and coordination of the agency's STEM engagement efforts." "Refocuses existing NASA activities towards exploration, by redirecting funding to innovative new programs and providing additional funding to support new public - private initiatives." "Proposes to end direct U.S. financial support for ISS in 2025, with a seamless transition to the use of future commercial capabilities." "Cancels WFIRST due to its significant cost and higher priorities within NASA. Increases funding for competed astrophysics missions and research." "Proposes to terminate NASA's Office of Education, including its portfolio of grants and cooperative agreements and redirects funds to NASA's core mission of exploration. NASA headquarters will continue to be accountable for strategic direction and coordination of the agency's STEM engagement efforts." By Keith Cowing on February 11, 2018 12:23 PM. "The Trump administration wants to turn the International Space Station into a kind of orbiting real estate venture run not by the government, but by private industry. The White House plans to stop funding for the station after 2024, ending direct federal support of the orbiting laboratory. But it does not intend to abandon the orbiting laboratory altogether, and is working on a transition plan that could turn the station over to the private sector, according to an internal NASA document obtained by The Washington Post. "The decision to end direct federal support for the ISS in 2025 does not imply that the platform itself will be deorbited at that time - it is possible that industry could continue to operate certain elements or capabilities of the ISS as part of a future commercial platform," the document states. "NASA will expand international and commercial partnerships over the next seven years in order to ensure continued human access to and presence in low Earth orbit." "The space station program manager of Boeing, which has been involved with the ISS for over 20 years, warned of privatizing the station. "Walking away from the International Space Station now would be a mistake, threatening American leadership and hurting the commercial market as well as the scientific community," Mark Mulqueen said in a statement to The Post." "According to excerpts from NASA documents obtained by The New York Times before the budget's release, the administration will propose $19.9 billion in spending for the space agency in fiscal year 2019, which begins on Oct. 1. That is a $370 million increase from the current year, the result of the budget deal reached in Congress last week and signed by Mr. Trump. The budget numbers were confirmed by a person who was not authorized to talk publicly about them. In future years, the administration would like NASA's spending to drop to $19.6 billion and stay flat through 2023. With inflation, NASA's buying power would erode, effectively a budget cut each year." "- Ending direct federal government support of the ISS by 2025 and transitioning to commercial provision of low Earth orbit (LEO) capabilities;"
o Aside from understanding the technical aspect of NASA and the components that goes into it. I can also understand the economics of launching satellites and supplies into space for both private and government entities. We all know that Richard Branson with Virgin Galactic, Elon Musk with Space-X and various investors including Shaun Coleman with Vector Space are racing for more contacts with NASA and others. This is a time when NASA can scale back without huge loss to their operation and we can continue to provide suitable funding for suitable research that benefits the citizens both scientifically and economically. It is not outrageous to believe that a small cut in the $105.5b budget cannot be cut by even a small percentage for a large gain to the taxpayers while providing a big win for the administration." By Keith Cowing on February 9, 2018 8:11 PM. Heavy Metal Landing from shrox on Vimeo. Keith's note: This video is a re-imagining of the classic scene from the 1981 feature "Heavy Metal". This time the Corvette is piloted by astronaut David Bowman from "2001: A Space Odyssey". 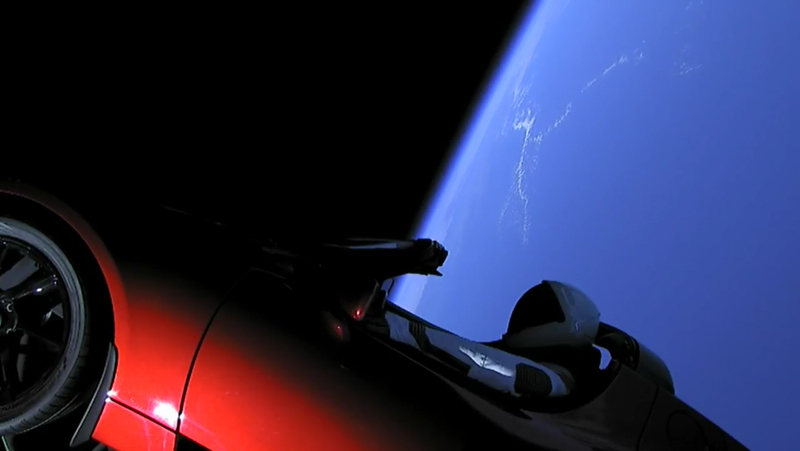 Sorry Elon, but Bowman is cooler than Starman. I'm sure Hal would agree. By Keith Cowing on February 9, 2018 5:23 PM.
" What is worth considering is the Tesla as a case study for future commercial space ventures. We've reached the point where individuals like Elon Musk and Peter Beck - in this case, two wealthy, white men - can make unilateral statements for humanity in space." Keith's note: Given the management and public outreach style of Bill Nye at the Planetary Society this is an odd comment for the organization to make. To be certain, the space community needs MUCH more diversity since the people who pay the bills and benefit from space are very diverse. But for an organization led by an outspoken rich famous white guy to be critical of 2 other outspoken rich famous white guys is hypocritical. NASA IT Declares A Symphony To Be "Meaningless Content"
By Keith Cowing on February 9, 2018 1:37 PM. Did NASA Turn Down A Ride on Falcon Heavy? Was One Ever Offered? By Keith Cowing on February 9, 2018 9:07 AM. According to @NASA PAO #NASA did not officially ask for payload space on the inaugural flight of #FalconHeavy nor did @SpaceX solicit a payload from NASA for that flight. Why Do We Need SLS? By Keith Cowing on February 8, 2018 6:43 PM. "NASA has spent more than $15 billion to try and develop their own heavy lift rocket, the Space Launch System (SLS), with a first flight planned in roughly two years - assuming all goes according to plan. Once operational, SLS will cost NASA over $1 billion per launch. The Falcon Heavy, developed at zero cost to the taxpayer, would charge NASA approximately $100M per launch. In other words, NASA could buy 10 Falcon Heavy launches for the coat of one SLS launch - and invest the remainder in truly revolutionary and meaningful missions that advance science and exploration. It is understandable that government employees, contractors and their elected officials want to keep this expensive rocket development program going. A large share of NASA's roughly $19billion budget has been spent on this constituency, and in turn is protected by them. We have come to accept this "tax" on the agency, but It is time for the nation to decide if we want a space program - or a jobs program." By Keith Cowing on February 8, 2018 4:42 PM. "The National Science Foundation (NSF) in Alexandria, Virginia, announced today a new set of measures to combat sexual harassment by people working on the projects it funds. The steps may include suspending or eliminating research grants after an institution finds that a grantee committed harassment. NSF said it will require institutions to tell the agency when they make such a finding. They also must report placing grantees accused of harassment on administrative leave while an investigation is underway. NSF Director France Córdova said the agency may suspend a project's funding in such cases. The policy allows the agency to take actions "as necessary to protect the safety of all grant personnel." The move comes as research organizations continue to confront reports that sexual harassment is rampant within many scientific disciplines and too often is ignored by administrators." Keith's note:I sent this request for comment to NASA Science Mission Directorate and NASA HQ Public Affairs referencing NSF's recent announcement: "Does NASA intend to establish guidelines similar to these announced by NSF with regard to requiring institutions to report instances of harassment?" NASA PAO's Response: "In response to your question on the recent announcement by NSF and your question about NASA's intention to establish similar guidelines, the following is the agency statement: NASA is committed to ensuring the safety of both our internal and external research community and their right to work in an environment free of discrimination and harassment. Since 2011, the agency has required its grant recipient institutions to provide NASA with information on all discrimination or harassment complaints filed under the institution's internal procedures, as well as any such complaints filed directly with a federal agency. Recipient institutions are required to provide this information every three years. NASA uses the information to assess the institution's civil rights compliance prior to awarding a grant, and for post-award compliance reviews under NASA civil rights regulations. The agency currently is considering means of further enhancing its policy requirements." Ted Cruz On NASA, ISS, Star Trek, Bridenstine and "OMB Numbskulls"
By Keith Cowing on February 7, 2018 6:28 PM. Continue reading Ted Cruz On NASA, ISS, Star Trek, Bridenstine and "OMB Numbskulls". By Keith Cowing on February 7, 2018 5:16 PM. By Keith Cowing on February 7, 2018 12:35 AM. By Keith Cowing on February 7, 2018 12:07 AM. By Keith Cowing on February 6, 2018 4:40 PM. This is really strange @SpaceX just broke the internet with its #FalconHeavy launch and yet the last time @NASA tweeted - or said - anything - was 5 hours ago. By Keith Cowing on February 6, 2018 4:00 AM. "SpaceX Launched its first Falcon Heavy today. All indications are that the flight has been a complete success thus far. More to follow. Pictures below." By Keith Cowing on February 6, 2018 12:33 AM. "Among the speakers at the rocket's unveiling were Elon Musk, President and CEO of SpaceX and Patti Grace Smith, Associate Administrator for Commercial Space Transportation, FAA. Musk and Smith were introduced by Keith Cowing, editor of NASAWatch.com"
By Keith Cowing on February 5, 2018 8:10 PM. "NASA's former chief exploration scientist, Michael Wargo, has been posthumously honored with the distinction of having a lunar crater named after him. Wargo Crater is an 8.6-mile (13.8 km) diameter impact crater sitting on the northwest edge of Joule T crater, on the far side of the Moon. Wargo worked at NASA from 1991 until his death in 2013." By Keith Cowing on February 5, 2018 9:49 AM. 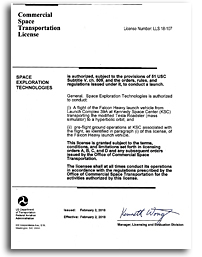 SPACE EXPLORATION TECHNOLOGIES Is authorized, subject to the provisions of 51 USC Subtitle V, ch. 509, and the orders, rules, and regulations issued under it, to conduct a launch. (ii) pre-flight ground operations at KSC associated with the flight, as identified in paragraph (i) of this license, of the Falcon Heavy launch vehicle. This license is granted subject to the terms, conditions, andlimitations set forth in licensing orders A, B, C, and D and any subsequent orders issued by the Office of Commercial Space Transportation. The licensee shaii at ail times conduct its operations in accordance with the regulations prescribed by the Office of Commercial Space Transportation for the activities authorized by this license. By Keith Cowing on February 3, 2018 11:40 AM. Keith's note: The next meeting of the National Space Council will be 21 February at KSC. The people selected to serve on the Users' Advisory Panel are starting to be notified that they have been selected and will be in attendance as well. More to follow. By Keith Cowing on February 2, 2018 2:38 PM. By Keith Cowing on February 1, 2018 10:20 PM. So one day a year we set aside time to remember those pioneers who paid the ultimate price for our modern quest. Altogether fitting and proper. And totally inadequate. Our progress has to be worth their sacrifice. Or we should not go at all. By Keith Cowing on February 1, 2018 10:04 PM. Keith's note: This was a very sad day. I lost track of number of the TV interviews I did. At one point I was doing 2 simultaneously while standing on top of a milk crate on the sidewalk outside of NASA HQ. No one knew anything other than the fact that the crew was gone. So what was I supposed to say? I managed to make it through the first 24 hours before I finally teared up and almost lost it during a CTV interview when I started to think of all my friends at NASA who had to deal with this loss on a personal level. Six months later on Devon Island a bunch of space people tried to encapsulate that day's grief into something that would last for a long time. "Our task was a somewhat solemn one. We were here to erect a memorial to Columbia astronaut Michael Anderson. Two memorials have already been erected by members of the HMP Team. The memorials take the form of an inukshuk, a stone sculpture in rough human form used by the Inuit to mark territory. These stone structures serve as reference points for those who traverse this desolate place. As we establish these memorial inukshuks, we do so for the very same reason the Inuit do: to aid in future exploration - in this case, of Devon Island. As such, these memorials will show the way for future explorers." By Keith Cowing on February 1, 2018 8:56 PM. "NASA recently posted an image taken by the Mars Hand Lens Imager (MAHLI) aboard NASA's Mars rover Curiosity. A reader from Australia contacted me to point out some curious structures within the rock featured in that image. I get a lot of emails like this. Normally these emails include something that the reader has totally distorted using Photoshop or contains some blurry shape on Mars that reminds them of a household appliance or cute little animal. I am a biologist and used to work at NASA's life science division and have done some fossil collecting in the field. So I've looked at things before that look like they are fossils only to determine that they are the result of non-biological processes. I noticed something curious about this image right away. ... I have sent an inquiry to NASA. Let's see what they say. I'll include their response in a revised version of this posting." Keith's update: My original source in Australia heard from someone@nasa to the effect that these markings are the result of the laser used to analyze rocks but that the markings look different this time. I am still awaiting an official response directly from NASA. Today's lesson: when looking for life on another world it is important to remember what is happening on both sides of the microscope. By Keith Cowing on February 1, 2018 1:54 PM. Keith's note: Here is a larger version of the image. See for yourself. 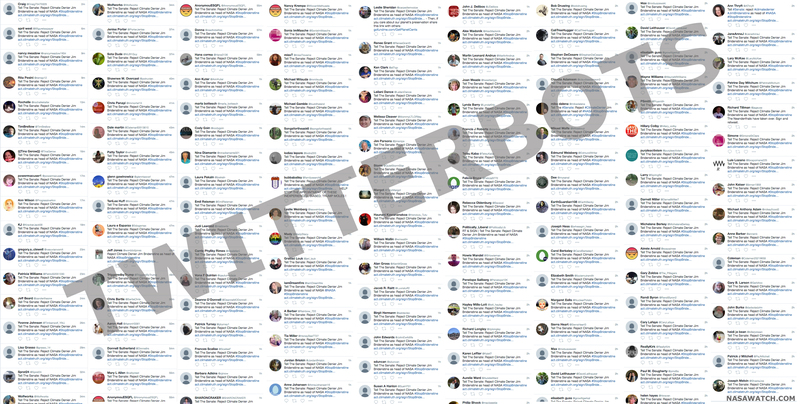 This covers just 2 hours of twitterbot spamming. Each click creates a unique URL that the sponsor uses to learn which Twitter accounts are getting the most click throughs. This is a methodical campaign and the sponsor(s) make no effort to hide that fact. These things cost money. This is the current meme from @ClimateTruth: "Tell The Senate: Reject Climate Denier Jim Bridenstine as head of NASA #StopBridenstine https://act.climatetruth.org/sign/StopBridenstine". If you go to the petition site and enter a name and email they do not send a confirmation email to let you prove who yo are (I tried). So the name "Holden MuGroyne" is on their petition now. Oddly many of the Twitter accounts tweeting #stopbridenstine stuff follow CT Gov @DanMalloyCT yet if you look at his followers https://twitter.com/DanMalloyCT/following you will see that all of them have protected accounts that you cannot follow. Something strange is going on. By Keith Cowing on February 1, 2018 11:34 AM. "We found that NSBRI delivered research products that helped NASA make progress toward the goal of mitigating human health and performance risks associated with space travel. However, while most NSBRI charges complied with applicable laws and the award's terms, NASA improperly permitted NSBRI to use $7.8 million of research funds to renovate and pay rent for laboratory space in a private building during the final 7 years of its agreement. ... In our judgment, NASA improperly approved NSBRI's request to use cooperative agreement funds to renovate the NSBRI work space. Lacking specific legislative authority, Federal appropriations may not be used for such capital improvements unless the expenditures meet specific Government Accountability Office (GAO) criteria. Moreover, the improvements to the facility primarily benefitted Rice University rather than NASA or the Federal Government. Indeed, at the conclusion of NSBRI's cooperative agreement with NASA in September 2017 possession of the facility renovated at NASA's expense reverted to Rice." This page is an archive of entries from February 2018 listed from newest to oldest. January 2018 is the previous archive. March 2018 is the next archive.